Subscriber Profiles store information about lists, subscriber data, campaigns and email responses for each subscriber. Every email address or SMS number imported into WordFly has a Subscriber Profile where data is stored and can be referenced. Your entire email and SMS program exists because of subscribers who have signed up to receive communications from your organization. 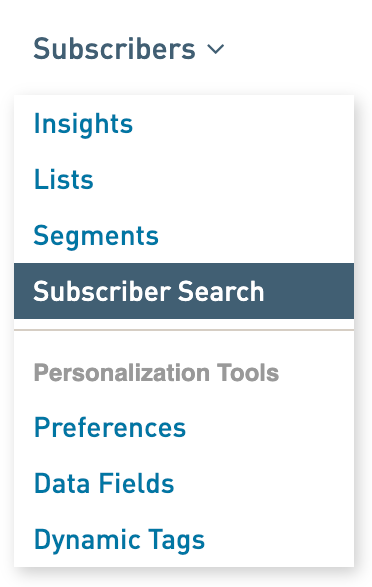 In WordFly we've created an entire section called Subscriber Profiles that is devoted to subscriber information. Each Subscriber Profile highlights key data about the subscriber that you can use to further target your emails and SMS messages so that you're sending the right message to the right individuals. Subscriber Profiles give you a place to review all the subscriber and list data that has been imported into WordFly through list imports. You'll find data like first name, last name and other default data fields here. Any subscriber and list data can be updated either manually or through list imports. You will also find unique WordFly data fields that only exist in WordFly and are only updated by WordFly. Many of these data fields together make up Subscriber Engagement Rating. All of these data fields contain valuable data about subscribers that could really pay off when used in segmented campaigns. You can Segment by these data fields. For example, you can create a segment that sends to any subscribers with an EngagementRating of 5 stars. Learn more. Subscribers > Data Fields You can see these data fields already created. Learn more. You can create if/then statements using these data fields. For example, you can create a dynamic tag that says "If a subscriber has an EngagementRating of 5 stars, show the text 'You're a 5 star subscriber...". Learn more. Reporting > Export Data You can export spreadsheets with these data fields to analyze in more detail. Learn more. Subscriber Profiles are created when a unique email or SMS number is imported into WordFly through Subscriber lists. Email addresses and SMS numbers are used as the unique identifiers for subscribers imported into WordFly. Go to Subscribers > Lists and click Create a new email list and follow the on-screen prompts to import a list. During the import process you will map Email from your list to the corresponding Email data field in WordFly. When the list is done importing, each new email address imported will have a Subscriber Profile created to store subscriber information. SMS subscribers are only imported under SMS > Send a new SMS. Follow the on-screen prompts to import an SMS list. During the import process you will map SMS from your list to the corresponding SMS data field in WordFly. When the list is done importing, each new SMS number imported will have a Subscriber Profile created to store subscriber information. 1. Go to Subscribers > Search. 2. Paste in your subscriber's email address and click Search. You can cruise through the Subscriber Profile to see subscriber engagement rating and data, Campaign activity, and list information.